Turkey's ambassador to Moldova said relations between the two countries reached the level of strategic partnership during a recent visit by President Recep Tayyip Erdoğan. Speaking to Anadolu Agency, Gürol Sökmensüer said during Erdoğan's visit on Wednesday and Thursday, a High Level Strategic Partnership Council was established. He said this was the first presidential level visit by Turkey to Moldova in 24 years. Speaking about Moldova's Autonomous Territorial Unit of Gagauzia, Sökmensüer said Gagauzia exists on paper since 1994. "However, Autonomous Territorial Unit of Gagauzia cannot collect its own taxes, it does not have a budget," he said. It covers its expenses by the resources allocated from the central budget of Moldova, he added. Turkey’s state-run aid agency launched over 400 projects and activities in Moldova over the last 24 years.Turkish Cooperation and Coordination Agency (TIKA) has been working in the Eastern European country in the agricultural, health, education, water supply, Infrastructures, and administrative sectors.Besides the activities and projects that TIKA launched in Moldova, it has also held numerous fairs, conferences, seminars, symposiums and penal discussions.TIKA had started functioning in Moldova on June 15, 1994.President Erdoğan's Moldova visit 'important, historic'ProjectsA renovation of Moldovan presidential residency started as part of Turkey's President Recep Tayyip Erdogan's initiative. The residency building was affected during the massive demonstrations that took place in 2009.The Turkish aid agency also built and equipped a kindergarten and named after Nasreddin Hodja, a Seljuk satirical from 13th century, as TIKA has been working on the education sector in Moldova on a large scale.The kindergarten will accommodate 72 students between the ages of 3-7. Students will be introduced to Turkish culture through activities and training.Erdoğan arrives in Moldovan capitalTIKA has also built a new diagnostic and treatment center within the existing regional hospital campus in Komrat, the capital of Gagauzia region. The center is named after Aziz Sancar, a Turkish scientist who won Nobel Prize for Chemistry in 2015.The center has improved the health sector in Moldova and Central Europe in general. Nearly 40,000 are treated in the center annually.As part of TIKA activities in Moldova, the design of Recep Tayyip Erdogan Educational Complex is finalized.The complex consists of a building, a dormitory, sports halls, a conference hall, and a dining room. The complex is expected to host 500 students.In 2015, TIKA has also renovated a nursing home which was built in 1972.The renewal of Mustafa Kemal Ataturk Library, restoration of Stratan stream, Building houses for flood victims in Tiger Lunga town, renewal of the water network line in the village of Vulkanesti, first aid training and support of emergency aid directorate in Gokoguz, and international security and cooperation projects are among the projects carried out by TIKA in Moldova in 24 years. President Recep Tayyip Erdoğan's official visit to Moldova on Wednesday is "very important and historic", said Moldova's ambassador to Turkey.Speaking exclusively to Anadolu Agency ahead of Erdoğan's visit on Oct. 17-18, Igor Bolboceanu said the visit will boost ties between the two countries.Bolboceanu said: "The agreements to be made during the official visit after 24 years will enhance our cooperation in economic, diplomatic and socio-cultural fields by giving strategic meaning to our bilateral relations. "Hailing the trade volume between the two countries, he said that Moldova supports Turkish businesspeople to invest in the country.Erdoğan arrives in Moldovan capital"We encourage Turkish businessmen to invest in Moldova. We are ready to help those who want to open hotels, restaurants and entertainment centers in our country,” Bolboceanu said. "The trade volume between the two countries increased by 22.47 percent in 2017 and by 7.2 percent in the first eight months of this year," he added.Stating that mutual visa-free travel is provided between the two countries, Bolboceanu said that the legal process has been completed for traveling with identification -- without passports. "We are thus eliminating barriers between the two countries," he added.Gagauzia, a bridge between Moldova and TurkeyBolboceanu said, "The Gagauzia Autonomous Region is a bridge between Moldova and Turkey. ''In December 1994, Moldova’s parliament offered some 160,000 Turkic Gagauz people within their borders a large degree of autonomy in order to create a favorable environment for maintaining a national identity and culture.The autonomous territory is home to a mostly Gagauz population -- an Orthodox Christian, Turkic community. "Gagauzians have an important role in the development of bilateral relations," he added.Stating that the Turkish Cooperation and Coordination Agency (TIKA) implemented many projects in Gagauzia and Moldova, Bolboceanu also emphasized the importance of the cooperation in the field of culture.Bolboceanu said that inauguration of the presidential building of Moldova -- renovated with the help of TIKA -- will be made during Erdoğan’s visit.During his official visit, Erdoğan will meet Moldovan President Igor Dodon, Prime Minister Pavel Filip and is expected to receive the Autonomous Territorial Unit of Gagauzia's (Gagauz-Gokoguz Yeri) President Irina Vlah.Political, economic and security ties will be discussed at the meetings along with mutual regional and international issues and terrorism.Erdoğan will also attend a business forum and is expected to inaugurate one of the pre-schools that was supported by Turkey's Presidency for Turks Abroad and Related Communities (YTB) with bilingual Gagauz-Moldovan educational material. 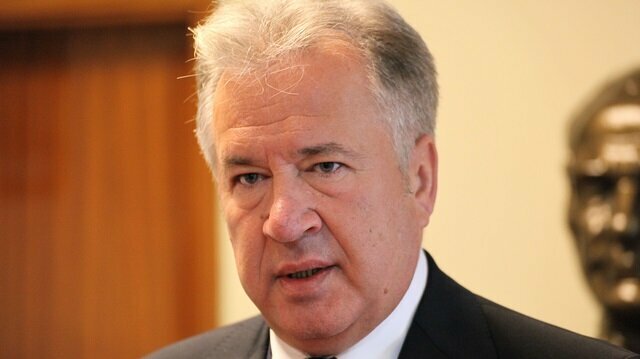 Sökmensüer said the autonomy of Gagauzia is only on paper and it is not totally autonomous. He said Gagauzia has a president who is also a minister and member of Moldova's cabinet, however there is a need for adjustment law regarding tax and budget issues. "We can say that the status of autonomy is not working in every field." He said the Gagauz people listened to Erdoğan's speech with great passion. He said Erdoğan spoke in Turkish language and the people understood it although their mother tongue is Gagauz, a Turkic language. President Recep Tayyip Erdoğan on Wednesday said that Turkey expects unhesitant support from Moldova in the fight against the Fetullah Terrorist Organization (FETÖ). "In the joint fight against FETO, the Turkish people expect from their Moldovan friends to show the support needed without hesitation," Erdoğan said.He also warned the Moldovans against FETÖ, saying that the terror group infiltrated state institutions and may do same in their country, in a press conference with his Moldovan counterpart Igor Dodon.A total of 249 people were martyred and more than 2,100 injured in the coup attempt perpetrated by FETÖ. The failed coup was organized by followers of U.S.-based Fetullah Gülen, who has pursued a long-running campaign to overthrow the government through supporters within the Turkish state, particularly the military, police and judiciary.Fifty FETÖ suspects arrested across TurkeyFormer teacher recalls experience at FETÖ schoolErdoğan also said that one or both of the Turkish public lenders Halk Bank and Ziraat Bank will open a branch in Moldova soon followed by inspections of the lenders in the country.Dodon, for his part, said that Turkey contributed to a "strong and stable" Moldova. "Turkey is an important example for the protection of our national interest and to create good relations," he added.Dodon also said he made a pledge to Erdogan to secure the autonomy of Gagauzia Region in the Moldovan Constitution.The autonomous territory is home to a mostly Gagauz population -- an Orthodox Christian, Turkic community.During his two-day official visit, Erdoğan is also expected to meet Prime Minister Pavel Filip and Irina Vlah, president of Autonomous Territorial Unit of Gagauzia (Gagauz-Gokoguz Yeri).Erdoğan is accompanied by Turkish Defense Minister Hulusi Akar, Education Minister Ziya Selcuk, Transport and Infrastructure Minister Cahit Turhan and Youth and Sports Minister Mehmet Muharrem Kasapoğlu.